The free world needs “robust leadership” to counter terrorists like those who brutally attacked the Charlie Hebdo satirical newspaper in Paris, Heritage’s Nile Gardiner told Fox News’ Greta Van Susteren. This is a battle for our God-given rights of life and liberty. That’s why every leader in the West needs to join forces to fight against the usurpation of these rights. “There is no doubt about it,” he explained. “We are at war against militant Islamists who seek our destruction and the destruction of everything that we stand for. Do you think the Obama administration is offering the “robust leadership” we need to fight the radical Islamists? 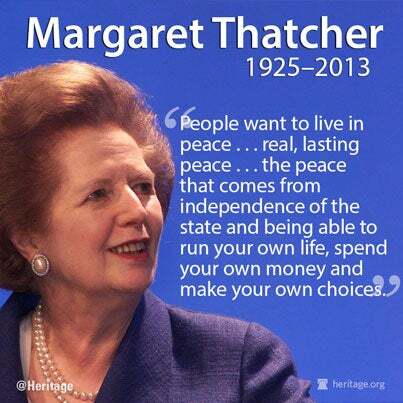 Margaret Thatcher, former British Prime Minister and Patron of The Heritage Foundation, passed away Monday morning. A great champion of individual liberty and freedom, her death will be mourned by all who support principled conservative values. Lady Thatcher was a conviction politician, and believed firmly that without American leadership, this world is a far more dangerous place. And, in order to protect and advance her legacy in the United States, she established the Margaret Thatcher Center for Freedom at Heritage in 2005. Deciding to found the center in Washington, rather than London, proved her immense faith in American global leadership. It’s important for us to remember the importance of moving forward with core conservative beliefs. If Heritage does not defend these very values that Margaret Thatcher fought for, then America will be a far less prosperous society — a society that does not hold onto the beliefs of individual freedom, individual liberty. And for Margaret Thatcher, individual liberty, individual freedom, are what makes the United States a great nation. How will you uphold Lady Thatcher’s legacy? Now Will Obama Recognize British Sovereignty Over the Falklands? In a referendum this week, the citizens of the Falkland Islands voted overwhelmingly to remain a British territory. It wasn’t close: 1,513 voted in favor and just three against. Do you think the Obama administration should stand with Britain? Britain and America should better heed Margaret Thatcher’s warnings about the dangers of deeper European integration, Thatcher biographer Charles Moore said Wednesday at The Heritage Foundation. As Prime Minister, Margaret Thatcher supported reducing barriers to trade between European countries but strongly opposed ceding sovereignty to unelected “Eurocrats.” She detested the idea of a common currency and fought to keep Britain in control of the pound sterling. The Senate could vote this week on a new United Nations treaty intended to protect people with disabilities. But in testimony earlier this year before the Senate Foreign Relations Committee, Heritage Foundation expert Steve Groves argued that ratifying the treaty is both harmful to American sovereignty and unnecessary to protect the rights of the disabled. Groves, who works in Heritage’s Thatcher Center, pointed out that a vast array of federal, state and local laws already protects people with disabilities. Ratifying the treaty would only make American laws subject to review by international bureaucrats who aren’t looking out for our nation’s interests. The British response to Argentina’s surprise invasion of the Falkland Islands 30 years ago holds lessons for the United States today, Heritage Foundation expert Ted Bromund argues. Prime Minister Margaret Thatcher’s swift and decisive action led to a rout of the Argentines. 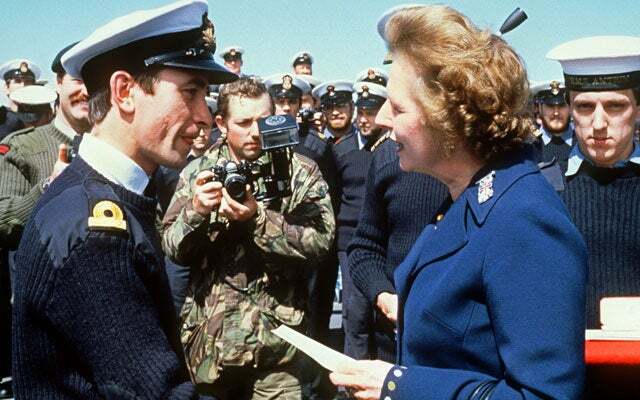 Last week marked the 30th anniversary of the end of the Falklands War. Strategic surprise is a fact of life; governments need to remember that and—especially in the realm of defense—keep enough reserve capacity and flexibility to act successfully when their predictions are wrong. Europe’s ongoing economic crisis is another sign the Continent needs greater national sovereignty and greater economic freedom, Heritage Foundation scholar Nile Gardiner told Larry Kudlow yesterday on CNBC. “In the long term, I think it’s only right that Europe returns to national sovereignty,” said Gardiner, who directs Heritage’s Margaret Thatcher Center for Freedom. But he acknowledged that a crisis in the Euro-zone could be economically challenging in the short run. What do you think is the solution to Europe’s problems? President Obama should take advantage of British Prime Minister David Cameron’s visit to Washington next month to recommit to America’s “Special Relationship” with the United Kingdom, Heritage Foundation scholar Luke Coffey says. “This visit will be an important opportunity for the two leaders to discuss the U.S. – U.K. defense relationship in light of recent defense cuts on both sides of the Atlantic,” explains Coffey, Heritage’s Margaret Thatcher Fellow. It is in America’s interest to have a strong British military partner. On the military level, the desire to increase cooperation is there. President Obama and Prime Minister Cameron need to help facilitate this cooperation. Like all relationships, the U.S.–U.K. defense relationship needs nurturing and direction. Both leaders should use this visit as an opportunity to expand military cooperation. Read Coffey’s full report here. 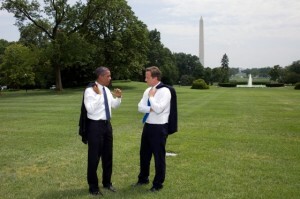 What do you think should be the most important topic of the agenda for President Obama and Prime Minister Cameron’s visit? As moviegoers hit the theaters this weekend to watch Meryl Streep portray former British Prime Minister Margaret Thatcher, many will want to compare Streep’s portrayal to the real Iron Lady. As Heritage’s Ted Bromund explained in Wednesday’s Morning Bell, there is no better resource than Lady Thachter’s own words. A new video produced by Heritage’s Brandon Stewart highlights her important legacy. Like President Ronald Reagan, her political soulmate, she came to power at a desperate time in her country’s history, when real leadership and bold ideas were most needed. And by applying conservative principles to the challenges she faced, she was able to achieve real and lasting success. Then, as today, she faced an extraordinary set of challenges and a chorus of voices saying her country’s best days were behind it. Thatcher’s successes are a comforting reminder of the power of a bold, conservative vision at work. Lady Thatcher is the Patron of The Heritage Foundation and helped establish the Margaret Thatcher Center for Freedom at Heritage in 2005. 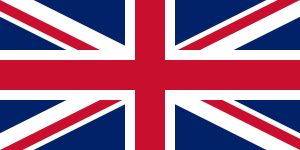 The Union Jack flies above British embassies worldwide--not English embassies. Yesterday, in a press conference about the storming of the British Embassy in Tehran by Iranian thugs, President Obama condemned the act and criticized the Iranian government. But in an apparent gaffe, the President referred to the embassy as the “English Embassy” rather than the “British Embassy”. No harm, no foul, right? Not necessarily.